After listening to hundreds of recorded small animal distress sounds, it becomes clear that some of them are going to be much easier to reproduce with a hand call than others. At the end of this page, you should be able to broadcast a few of those easy-to-blow sounds that will actually call a coyote. Then, it's up to you to use them and gain confidence in the field. Killing a few coyotes with your new sounds will keep you interested in calling. If you pick up any handcall and blow, like you would blowing up a balloon, the handcall should make some kind of sound. That crude first try probably won't sound like an accurate reproduction of a buckshot jackrabbit though. It takes some work for the average human to sound like a dying rabbit, or a hurt pup, or anything else. One of the members, Capt. Obvious, says that the sound depends on both how the call is held at one end and how it's blown at the other. Hold the call behind the mouthpiece in the web of the thumb and forefinger of either hand. Close the thumb and forefinger around the tube of the call by making the "OK" sign. That's a great start. Now hold the call there and do nothing with that hand for a while. Scroll down with the other hand while you read a few more paragraphs. In this text format, one of the best ways, maybe the only way, to describe the motions your mouth and the source of the air for the call is with some very odd words. Major Boddicker, the producer of Crit'R Calls, describes the sound he makes as wwwHOO or wwaAAAa. He also recommends repeating the sound 8-12 times in rapid succession, and repeating the series 2 to 3 times per minute. That's great advice. Whether it's Owwww, wwaAAAa, Haaat, or HooOOook, it looks a little strange in text, but mouthing the word as it's written is meant to relay how to blow the air and move your mouth to make the right kind of sound. In some cases, it's meant to convey how your lips, teeth, jaw, and tongue should move and where the air starts and stops. In others, I just hope it doesn't confuse the reader too badly and turn them off of hand calls completely. The CAPITAL letters in the wwaAAAa show emphasis, maybe a little louder at the capitals, where it may take a little more air to the reed. It's like hitting your thumb with a framing hammer. You don't just say,"Damn!" You say, "DDDaaaaAAAAM!?!*! That weird spelling is meant to convey some extra air and confusion that usually happens with the smashed finger. Realistically, if I used DDDaaaaAAAAM! as my weird word and blew it into the handcall, the air would start from the toungue against the roof of the mouth, waver up in emphasis, and end by closing the lips. Some sounds are easier to blow than others. If the goal is hunting and taking game with one of your sounds, and not a 15-second demonstration, that sound should be easy to blow for a length of time, as much as 10 or 12 minutes worth. It shouldn't be too hard to repeat over and over a couple of hundred times. It shouldn't make your ears ring, wear you out, make you spit, dry you out, freeze you up, or require movement that gives away your position. Good luck with all that. It will never work out that way. Trying to blow a call and stay still, gun in hand, ready to shoot, isn't easy. Call the 3 series of 8-12 notes, pause and repeat. The best case - you'll realize that there's a coyote standing there staring at you. The worst, you won't. Some animal screams have rhythm. Like music, any tune is combination of sounds and pauses between them played at speed. One of the best, easiest to blow, and one that calls predators, is the repetitive cry of a distressed rabbit. Hundreds of real animal recordings prove it. The rabbit's beat is about as fast as you count easily out loud - 1, 2, 3, 4, about two beats per second. One of the keys to handcalling is learning to blow well-timed blasts of air across the call's reed with the same speed and timing of a real rabbit. A good call comes from starting, blowing, stopping, pausing, and repeating with the same timing as the scream-inhale, scream-inhale cycle of the rabbit. The good news is that many good rabbit sounds turn out to be about 4 tenths of a second long with pauses between them about 2 tenths each. Better news is that you can learn to blow those 4 tenth sounds, pause, and blow another in rapid succession. Your ear can even learn to recognize 4 tenth, 6 tenth, 8 tenth sounds, and 2 tenth or longer pauses, which means you can copy many rabbits and blow other sounds too. If a picture would suffice, check out the audiogram of some well-known sounds below. (JSSqBird, JSHPCottontail, JSGrownCottontail, FPLightningJack, handcall) The timing of the scream-inhale cycle is easily seen and measured. Blowing a handcall is 90% rhythm. Intonation will take care of itself. If you can blow and stop blowing the same cadence as any of the upper four sounds shown above, you will call all kinds of curious critters. The fifth recording shown above is a man with a handcall. That audiogram shows that both the rhythm and the silent portions need improvement. There are a couple of ways to get air to the reed in any handcall with an appropriate cadence. You need to know them both. One kind of air comes from the diaphragm. Learning to mimic an actual sound, copying a popular rabbit sound, Johnny Stewart's High-pitched Cottontail (102C), means YOU will have to blow for 4 tenths of a second and wait 2 tenths and blow again in a sequence (just like the rabbit). The best way to get you to blow this 4/2 cadence is to make you use a long loud hard belly laugh, HA HA HA HA HA HA HA HA, but without using the vocal chords. Think Santa Claus. Really, put some effort into it, push air from the diaphragm and try to generate more than volume, generate some pressure. Mad Santa, bad Santa, drunken Santa. HA HA HA HA HA HA HA HA (eight times should take 5 seconds for the right cadence). This kind of breathing comes from the diaphragm and takes all your wind. That's what it's going to take to get you to blow a basic rabbit call, a very loud one. Don't forget, while you're blowing the call you still need to breathe, getting enough oxygen to stay conscious, while you're calling, not falling. Laugh a lot like an idiot with no vocal chords in the desert. Inhale. Diaphragm calling forces you to integrate your own breathing with blowing the call. Don't pop a vessel, hyperventilate, or get hypoxia and fall in the cholla. There is a second way to blow a handcall. Spit talkin', by "spitting" a mouthful of air into a call with the back of your throat closed, is another great way to get air to the reed. It isn't as loud as blowing from the gut, but it doesn't take away your wind either. It should feel like spitting a big gulp of hot coffee back into the cup. Breathe naturally through your nose and close the back of your throat. Pump a mouthful of air into the call's reed with just your jaws, cheeks, and tongue. NO open throat. Close it now. NO lungs! NO cheating! Spit talkin' isn't as loud as a call blown from the lungs and diaphragm, but it's a great way to blow several good sounds that you'll want to use when you're hunting. Spitting mouthful after mouthful of air into the call using just your tongue and jaws as a pump isn't easy, frog boy, but it sure works. If you get a cramp in your neck, take a break and hit the play button on the FoxPro. Like anything else, it gets easier with practice. 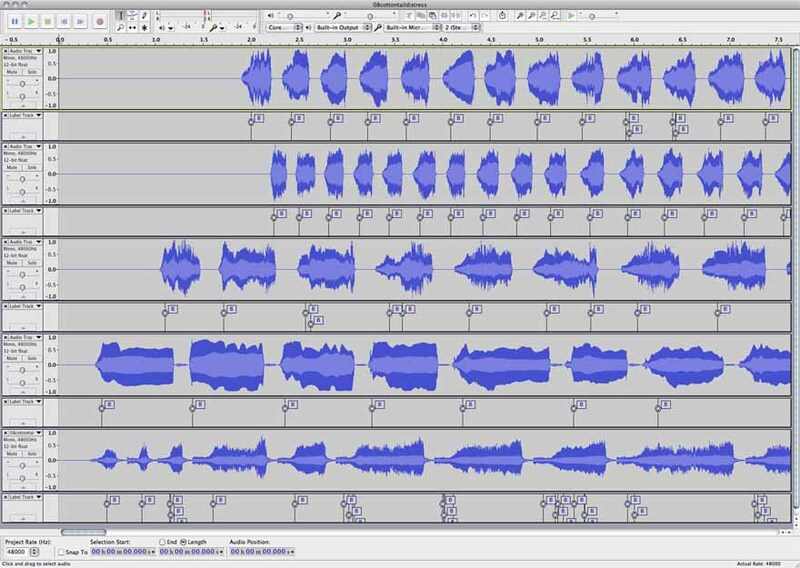 Note: Audacity is a free sound editing program that makes it fairly easy to measure the length of sounds, among other things. Every call has a few tones or notes it likes to play. Starting with any new call means identifying those notes. If you're starting with a closed reed call, blow gently into the call until it makes a clear, steady, low tone. Then blow a bit harder and notice the call change up in pitch. Again, blow a bit harder and play another tone. Most closed reed calls can be made to play 3 or 4 notes this way. If starting with an open reed call, you can find those natural notes with a slide up in pitch. Start by taking a gentle bite on the base of the mouthpiece nearest the tube and blow a note. Try it with lips only. Then try again with a tooth biting lightly on the middle of the reed. Slide half way to the tip and blow the next note with both lips and teeth. Then blow a note using just the tip of the mouthpiece. Finally, there may be one or two higher notes that come with blowing harder and harder on the tip. Slide up in pitch - Start with your lips or teeth at the base of the toneboard and blow on the call while slowly pulling it out of your mouth. Most open reed calls typically have a large range and it will be possible to reach some high notes blowing on the tip of the mouthpiece with some practice. Slide down in pitch - Start at the tip of the mouthpiece and blow on the call while sliding the lips or teeth toward the base. At the base, a short blast of air should make a grunt or honk noise. Some open reed calls will slide up and slide down smoothly, almost flawlessly. Others are not so smooth. They seem to have break points where the note may skip an octave or more. Those break points can be hard to integrate into a good sounding call. The thick rubber band (that comes on Crit'R Calls), called a castration band by stockmen, is a handy addition to any small open reed call. The band, does a couple of things. First, it's grippy, and makes it easy to hold the call with lips and teeth. It lets the caller blow hands free. Second, the rubber band can be adjusted up and down the mouthpiece to change the note. With the reed held down by the rubber band, the same note can be produced time after time with better consistency in any long sequence. The way a call is held is almost as important as the air that's put in it. Partially blocking the end of the tube while the call is being blown changes the sound and uncovering it changes it back. Those sounds, covering the opening of the tube with either the pinky, ring, and maybe middle fingers of the same hand, or with the other hand, or just using a fingertip, are some of the controls you'll need to try if you'd like to make some of the more realistic prey sounds. Maybe it's the other way around. You decide which is what. Your ear will be better than my call words. Vibrato - This wavering sound can be made by opening and closing the fingers a small amount in rapid succession. Vibrato is also used by many musicians. String players do it by rocking the neck hand. With practice, vibrato on a hand call is possible by moving a finger or two in and out. Vibrato can also come from the diaphragm and breath control by blowing a bit harder and then less hard in rapid succession. Woodwind and brass musicians do it the same way, with breath control. Back pressure - By blowing harder on any call, open or closed reed, the reed closes down from the increased pressure and the call plays a higher note with less air. It feels like it's pushing back. It's similar to playing a note from the tip of the call, except no bite is required. Another kind of back pressure comes from closing the fingers on the tube. Blow hard against the blocked tube and as you remove your fingers, the pressure is transferred to and partially closes the reed. I'm for anything that uses less air, still makes a usable sound, and lets the guy doing the calling breathe without passing out. Blowing hard on a call and letting it close on its own to a natural note can have some unexpected results. The call can buzz, get raspy, or even sound like it's playing more than one note at a time. Weird but true, often enough it's these unusual sounds blown in a realistic rhythm that call coyotes. Cottontail Distress - Rabbit distress should be considered a "go-to" call in every hunter's primary arsenal. A proven killer like JS 102C High-Pitched Cottontail (from CD Coyote 2) is definitely worth trying to mimic and one of the simplest. Hold it one hand, in the web of the thumb and forefinger, in the circle of an OK sign. A closed reed call with a "medium" to "high" pitch is best. OR, start with an open reed call by putting lips or a tooth in about the middle of the reed and holding it with one hand. Then use your best belly laugh with no vocal cords. Imagine HA HA HA HA HA HA HA HA HA HA while trailing off a little toward the end. Using just one hand to hold the call, laugh from the diaphragm. The one hand call using the belly laugh with either the open or closed reed is probably one of the easiest to master. It is both loud and good enough to call coyotes. It leaves a hand free for a gun. Blow about three of those belly laughs into the call and wait a minute or two. Keep your body and hand motions at a minimum. Keep your eyes swiveling but do not move any faster than the second hand on your watch. Ernie Wilson has his version of a cottontail hand call recording at EWCalls.com. His sound for each breath of the rabbit's scream is a bit longer and more complicated to blow than the JS sound mentioned above. His is more of a Wa-ah Wa-ah Wa-ah and he's using a bit of cupped vibrato. So once you've got the cadence and breath, either the simple laugh or Ernie's slightly more complicated version, try adding the finger controls. Just close the fingers that hold the tube of the call around the open end and then take them off. Try it a few times with the Oww and the Wah, and then try your hand(s) at vibrato by shaking a hand or moving your fingers. Jackrabbit Distress - JS 101G Vittles Ala Jackrabbit is also a known killer. The individual screams range between 8 tenths of a second and 14 tenths. The jackrabbit takes another 2 tenths to inhale. The sound is a little lower in pitch and maybe a bit raspier than a cottontail. Closed reed makers try to tune their reeds to reflect a lower and raspier sound, plus they can sell you another call, the "jackrabbit" version. Open reed callers will have to slide down a little on their call to a lower pitch. The cadence is completely different from our HA HA cottontail since the sound is 2 to 3 times longer than the cottontail but the pause is the same. The cadence is more HaaAAaa HaaAAaa HaaAAaa. Using another weird but realistic call word, try blowing Major's wwwAAaa 7 times in about 10 seconds. Repeat the series. I like this version. It's just a little harder to blow than the cottontail. If you take the time to really listen to a lot of real grown cottontail and jackrabbit recordings, you'll find a lot of different sounds. Some sound downright complicated. Your goal isn't to copy every difficult nuance of a dying jackrabbit's last breaths. Your goal is to find the right note on the handcall and make a clear loud scream with a lifelike jackrabbit cadence that calls a coyote. Some calls you may have heard before might go a wah too far. The poor dying jackrabbit scream occasionally gets transmogrified by some hand callers into their own interpretation of something that has a lot bigger lungs than a jackrabbit. I named it the grammatically incorrect "Woe is me" or maybe that's the "Woe is MeeeeEEeeEEee" call. Imagine a rabbit with man-sized lungs saying wwaaAAaaAAaaAAaaAAaa, using vibrato from the diaphragm. It doesn't sound much like any recorded call of any animal I've ever heard, but it still calls coyotes. That's important. It calls coyotes. I'm not sure I like using this call much. It's a lot of work and blowing it leaves me out of wind. Vibrato from the diaphragm isn't easy. It gives me a headache. Pass the aspirin. Call the paramedics. Pup Distress - After listening to a lot of different pup distresses and whines, that's what they are, different. Some pup distress is a jumble of chirps in that are only 2 tenths of a second short or shorter. Those kind of sounds are difficult for a human to blow without getting all jumbled up. FoxPro's C27 Coyote Pup Distress starts with some pup chatter where the sound is 1 tenth and the pauses are between 1 and 2 tenths. Those whines develop into recognizable whining sounds about 7 tenths of a second long with 2 tenth pauses. Those longer whines are the kind of whines you want to copy because they're easier to blow. Whines 7 tenths long from the tip of a closed reed are very manageable. A beginner can put the rubber band about about half way down his Crit'R standard, bite down on the tip, and blow medium hard for a second or less while releasing some of the tooth/lip pressure on the reed. You'll make a very passable pup whine. Or instead of releasing bite pressure, a little slide down also works by tipping the call a bit into your mouth. Both styles will make a passable pup distress. The second way I like to make a pup whine, especially as a coaxer, is spit talkin' a mouthful of air into the same call, the tip of open reed with the band about half way down at the same 7 tenths cadence. This will generate some outstanding whines, like listening to a terrier that's been shut out on the back porch but still smells the bacon cooking in the kitchen. It won't be very loud, like the dog pushing his nose into the weather strip, but it's the best way I know to imitate Foxpro's C17 Coyote Female Whimpers. That sound is as close as you can get to infamous Estrous Chirp also known as the Do-Me whine. Rodent Coaxer - This is not a loud call. It's often used to coax a coyote into making a final approach. Using a cadence of 2 tenths for the sound and 2 tenths for the pause, works very well, but it's about as fast as I care to blow on a call. The rodent squeak is another of those sounds where the air can come from the mouth, not the diaphragm. Using a standard or small open reed call, put the teeth 1/4" to 1/2" from the end, hold the tip down tightly and spit the air out of the call in a quick series of 8-10 squeaks by pumping air using just the tongue and cheeks. The squeaks should be very short and close together. Spit talkin' with your tongue produces a very effective rodent sound.